Use YOUR Clubs to Benefit the YOUTH Club! One of the benefits of living in South Florida is the fact that Golf Season lasts well into the fall for us. 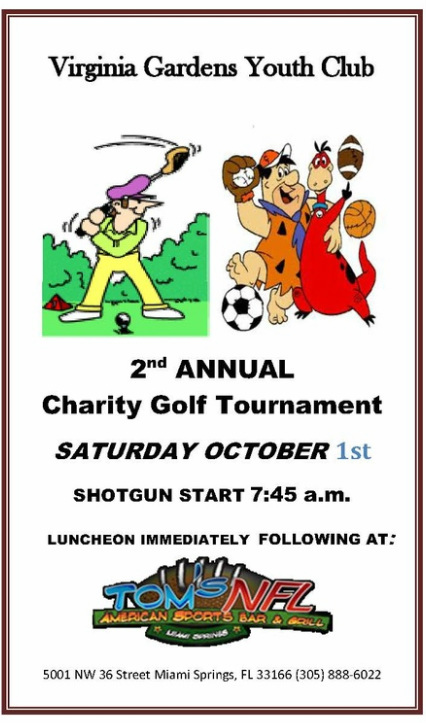 For those of you looking for some tournament competition that benefits a great cause, Tom's NFL American Sports Bar and Grill is partnering with the Virginia Gardens Youth Club to host their Second Annual Charity Golf Tournament Saturday, October 1st (Registration 7:00 a.m. - Shotgun Start at 7:45 a.m.) at the Miami Springs Golf and Country Club! Entry Fee is just $90 per golfer and includes cart, goodie bag, a terrific lunch at Tom's NFL, and your shot at a year's worth of bragging rights, plus Longest Drive and Closest-to-the-Pin contests, Raffles and a Live Auction. You don't want to miss this! The Virginia Gardens Youth Club has been a long-time partner of the programs of the Miami Springs/ Virginia Gardens Optimist Club, and we're pleased to be able to lend our support to their 2nd Annual Tournament! This has become a very popular event in the community, so you don't want to delay registering your foursome (or securing priceless publicity for your company via one of the many sponsorship opportunities!) A map of the location for the Miami Springs Golf Course, as well as downloadable entry and sponsorship forms are here, and also available online at www.vgrec.com.